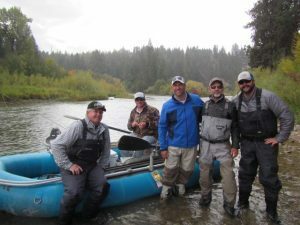 We had a great group for our Montana trip this year and it was really nice to get out of our hot Arkansas summer weather and into the beautiful fall like weather in the mountains outside Missoula, Montana. We fished the Blackfoot, Clark Fork and Bitterroot Rivers all of which were quite low. Montana had an early and fast snow melt this year with a quick runoff and really not a lot summer rain so it is a low water fall. 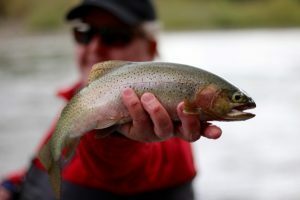 Regardless we fished hard and were well rewarded with some really nice Cutthroats, Rainbows, Browns and some amazing Bull Trout. We will save the Bull Trout stories for a later post. 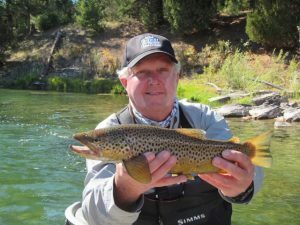 The October Caddis were in full force and a dropper of a RG/PT Cruiser was a steady producer. Hopper-dropper rigs also produced well and the early afternoons gave us some wonderful Blue Winged Olive hatches. 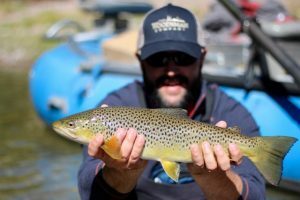 Getting to fish dry flys with 4X and 5X tippet is a real treat for us Arkansas boys who are used to having to go to 6x and 7X tippet on our dry fly rigs. 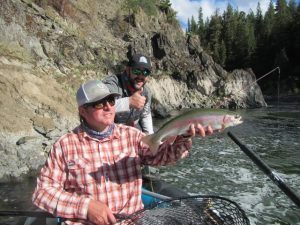 Oh yeah, we did not forget about the streamer fishing which even on low water stuck some good Browns and Bull Trout; but the Bull Trout are for another post. We rented a great house on the Bitterroot River near Lolo Creek and of course Tom Hawthorne, the Ozark Angler, (www.ozarkangler.com) served as the official chef for the group. Tom’s world famous spaghetti sauce was again a highlight of the trip! Clayton Paddie is an Arkansas native and he and Trent were classmates at the UofA. Clayton and Adam Spenner of Missoula Troutfitters provided the guide service and all of their guides did a wonderful job. If you are going to be fly fishing out of Missoula, Montana be sure to check their Facebook Page @missoulatroutfitters. They will do a great job for you. 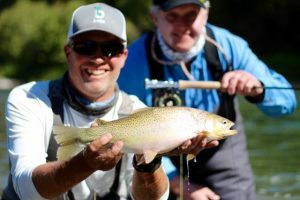 We again celebrated Trent’s birthday during our Montana fly fishing adventure. We are getting really good a finding the most out-of-the-way bars in Montana. Sump’s Bar in Twin Bridges, Mt., a couple of years ago was classic and this year we found Lumber Jack’s Saloon outside Lolo, Mt. To say it is outside Lolo, Mt., is an understatement. It is way outside of Lolo down a dirt road that you would swear was going to end up at the place in the movie, A River Runs Through It, where Brad Pitt went to gamble. It is an amazing log structure that was the place for all the loggers to gather after a hard day of cutting trees fifty years ago. The old gentleman that owns it has sold it three times since 1994 and just got it back for the third time which will hopefully be the charm. The place is really unique and some of the best fried chicken I have ever eaten. Just the perfect place for a backwoods chicken farmer from Arkansas to celebrate a birthday! Bull Trout stories to come.